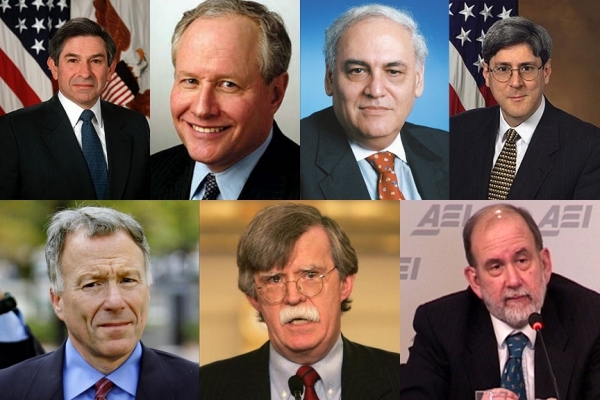 The neocons were originally Trotskyites, who have managed to infiltrate United States presidential administrations and influence United States foreign policy from a militaristic perspective. They have played key roles in the administrations of Ronald Reagan, Bill Clinton and George W. Bush. Now they have a strong influence in the Trump administration but the top neocons are moving over to the Democratic Party once again. Neocons have kept America at almost continual war for a century. They started on the Left in the 1930's ... Maneuvered to the Right and peaked in the George W. Bush Admin. I wonder if Trotsky, Wolfowitz, Kristol, Perle, Feith, Libby and Leeden have anything else in common?